One of the oldest paint workshops of the world have been found at an ancient settlement in northwestern Turkish province of Eskişehir, Anadolu Agency reported Thursday. 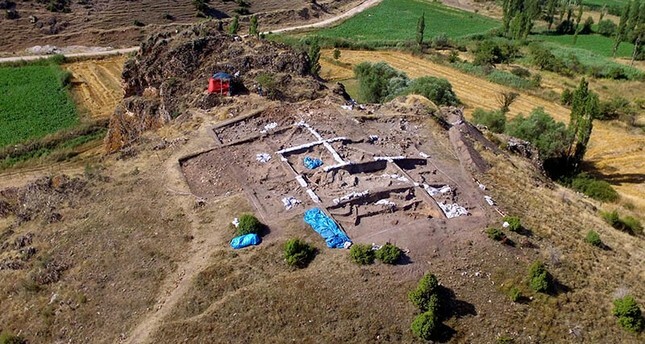 Archaeologists working at the ancient settlement mound of Kanlıtaş discovered traces of paint from 6,000 B.C. at a workshop. Located north of central Eskişehir, the settlement lies on the northern slope of a hill in the middle of a valley. Considered to be the oldest settlement of Central-West Anatolian region, the mound was a permanent settlement encircled with large retaining walls to the east and the west. Anadolu University Archaeology Professor Ali Umut Türkcan told the Anadolu Agency that the large walls provided protection for the ancient people. He noted that their research concluded that the mound was used as a production center and a workshop. "Since the beginning of excavations we wondered if a paint workshop existed here. We discovered samples of paint in mortars, ground stones and a container" Türkcan said. The researchers will not analyze the source of the paint to determine whether or not they were from organic or mineral sources. Türkcan also noted that they think the paint could be red ocher, which is produced from mineral sources. Research at Kanlıtaş Settlement Mound started in 1989 after Eskişehir Archaeology Museum's discovery. Türkcan and his team have been working at the site since 2008. They have discovered two mounds, Paleolithic workshops and three necropolis sites.